Will Brockton High’s Principal Succeed Where Mayor Bloomberg Failed? “Brockton’s success has come from an administrative team that has worked together, and I would like to see that consistency of leadership continue,” says Szachowicz, a Brockton High graduate who understands that succession planning represents the final test of her leadership: Whether the school’s culture and its record of steady improvement over the course of more than a decade—on the latest state assessments, 96 percent of Brockton students passed English Language Arts–will survive the transition to a new principal. Szachowicz seems to have planned her retirement with the same care and shrewdness that enabled her, when she was still a history teacher, to persuade her colleagues to band together behind what became a years-long commitment to improving literacy across every department at the school. In her letter to students, Szachowicz explained that she was leaving after the fall semester because she didn’t want the graduating class of 2013 to be “diverted by talk of the principal’s retirement.” In a separate letter to faculty, she also emphasized the values that characterized the school’s improvement strategy, including teamwork and school-wide leadership. Leadership is about teamwork, and I have said often that I have been the most fortunate principal in the world because of the fabulous leadership team at Brockton High. The superb leadership of our Associate Principal, Sharon Wolder, and the entire Administrative Team will continue the success of Brockton High. 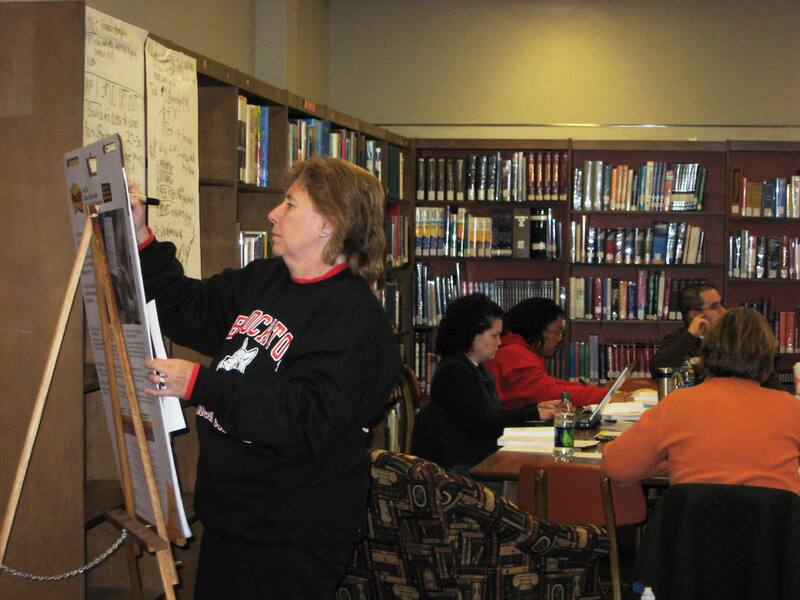 Brockton launched its literacy strategy in the late 1990s, when Brockton, which once cared more about football than academics, faced the possibility that the majority of its students wouldn’t graduate. At the time, a new education-department policy threatened to withhold diplomas from any student who didn’t pass the Massachusetts Comprehensive Assessment System (MCAS) test. In response, Szachowicz and a colleague, Paul Larino, who retired years ago, drafted teachers to join a “restructuring committee” that came up with a school-wide multi-disciplinary literacy strategy. As a unionized school, Szachowicz and Larino had to rely on the power of persuasion and on getting teachers not only to share their vision, but to refine it and execute it—and all within union guidelines. Along the way, some teachers who chaffed at the changes left, but the majority stayed. At the heart of the Brockton culture is not only an obsessive focus on improving literacy across the school, from English and history to math and science. Equally important was the decisions to make teachers equal partners in the improvement effort. At the restructuring committee meetings, a largely middle-aged cadre of teachers, many of them with decades of experience, continue to hash out the latest iteration of the literacy strategy. Last year, the school worked on developing teaching modules to improve how kids read and analyze visuals, such as graphs and charts. Last year, also, the school marked another milestone in student achievement: 82 percent of students scored in the top two levels—proficient or advanced—in ELA, and 70 percent tested in the top two levels in math. Szachowicz may be leaving in December, but the schedule for the restructuring committee meetings has been set through the following spring. This year, in addition to analyzing visuals, the school is zeroing in on non-fiction reading and writing, as well as “word attack strategies” for vocabulary. Meanwhile, back in New York, as the 2013 mayoral election and the end of Mayor Bloomberg’s final term looms, many school leaders who, for a time, enjoyed the decision-making power made possible by Klein’s decentralization efforts, are once again feeling the centrifugal force of bureaucracy and new limitations on their autonomy. “You need to be able to build a culture that can last beyond the departure of a charismatic leader,” says Eric Nadelstern, who served as deputy chancellor under Klein, and whom many expected to be his successor. (After a few short months as chancellor, Cathleen Black, the publishing executive, was replaced by Dennis Walcott, a long-time education official.) Without enough time to embed a new culture, the old “roles, rules and relationships” reassert themselves, adds Nadelstern who now teaches at Columbia University’s Teachers College. A few years ago, Rakesh Khurana, a Harvard Business School expert in leadership development, wrote about the irrational market for CEOs in his book “Searching for a Corporate Savior,” and how corporate boards frequently search for outside “stars,” rather than selecting knowledgeable insiders, to succeed an outgoing chief executive, often to the detriment of the organization. Mayor Bloomberg, it should be noted, called Black “a superstar manager” when he appointed her. At Brockton, Szachowicz is betting that a knowledgeable insider is best positioned to ensure that the school’s culture of literacy and teamwork will endure. 3 Responses to Will Brockton High’s Principal Succeed Where Mayor Bloomberg Failed?